This quilt focuses on the visual effect of playing with block orientations. I find the the simpler the blocks, the more pronounced the effect. Oh, and the freshness portrayed by the fabrics…. aren’t you just feeling the spring vibe coming through, especially if you feel like you have lived in a freezer in the last few weeks, like I do? 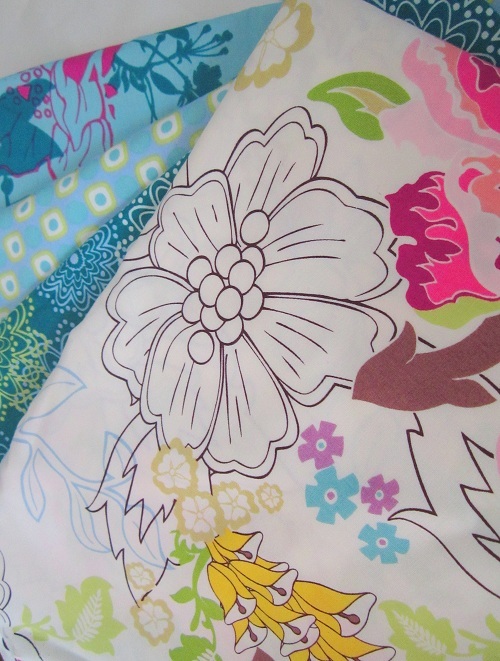 The fabrics are from Pat Bravo’s Paradise Collection, produced by Art Gallery Fabrics. Quilting is done with Aurifil Mako 50 threads over Hobbs Tuscany silk batt. If you haven’t read about my thoughts on Aurifil threads and Hobbs Tuscany silk batt, click here and here to read. The quilting motif is my allover Jester’s Hat. Click here, here, and here to read about Jester’s Hat. 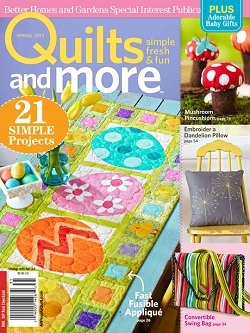 It’s always exciting to have something featured in Quilts and More. I am doubly excited this time because I actually have two projects featured in the same issue. Stay tuned for when I share about the other project. I shall end my rambling with this last picture. Thanks for stopping by – till tomorrow. God bless! 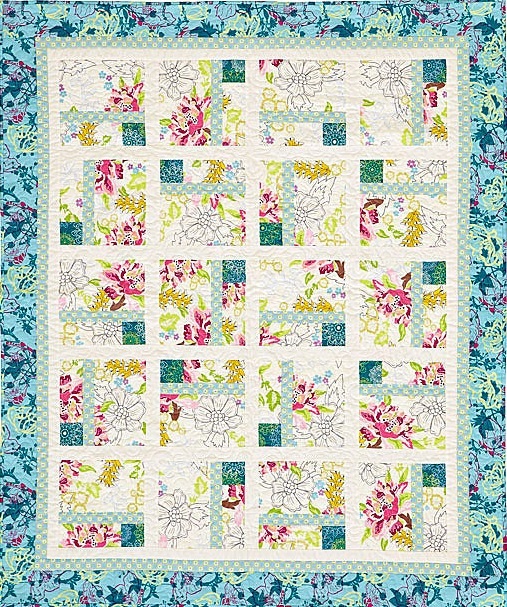 This entry was posted in Quilt Pattern, Quilting, Quilts & Projects: Published, Quilts: Pieced and tagged Art Gallery Paradise Fabric Collection, Pieced Spring Quilt, Quilts and More Spring 2013, Wendy Sheppard Designs. Bookmark the permalink. WOW love the fabrics! it is lovely! So light and airy looking. Ooh, I am liking this one! Love the colors. The quilting shows up beautifully. It took me a while, but I finally am comfortable with stitching Jester’s Hat. Stay warm. Snow is expected in Franklin, TN tonight. I love this one Wendy! 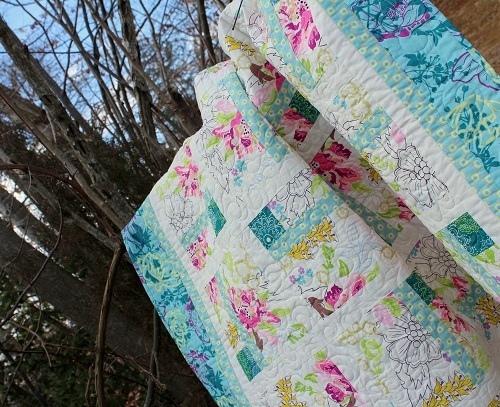 Love the quilt and love the pictures!!!! This turned out really lovely. I do like the simplicity you created. Looking at the fabric line, I would have passed it by, but you made me take that second look with your creation. Fabulous job as always. Ok this one is for me I love the pattern you die that features the fabric so well. Wendy, I just LOVE this quilt. The fabric is so refreshing. You did an awesome job! Wow! Beautiful quilt. Definitely has the look of spring. The little splashes of turquoise is so refreshing. Looks like you had a lovely blue sky day to take the photos. I really want to make this quilt. Those colors are luscious!!! That is a beautiful quilt. The fabrics are gorgeous! But what I really love is the pattern…so very versatile! 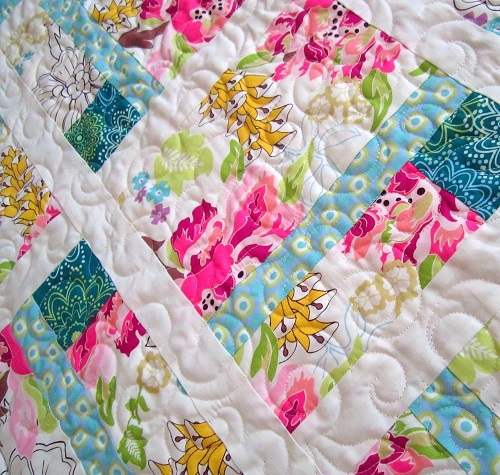 I can see using this pattern in a lot of different ways…baby quilts, a quick quilt for a gift…maybe some of my Kaffes!! 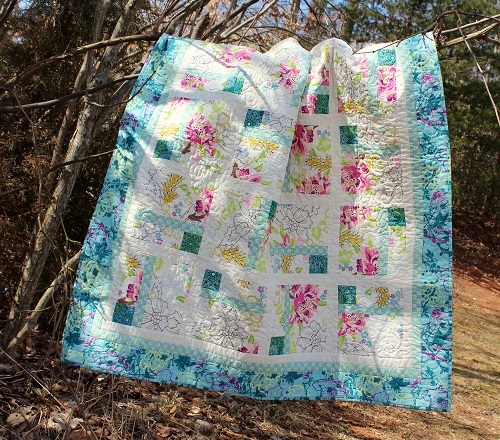 Another beauty — the fabrics make me think spring might show up one of these days! Your quilts are so beautiful. 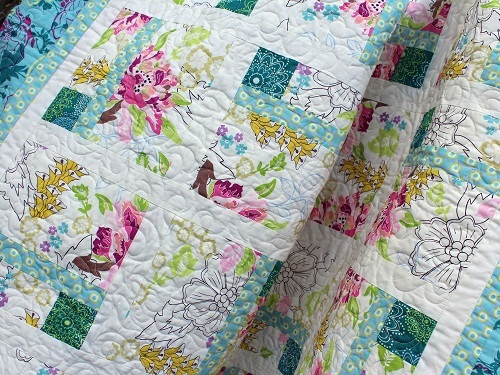 I hope to be able to quilt like that. I have finished the straight quilting lines and getting excited but have found out that my machine is too old for a quilting foot. The foot I thought was a quilting foot was actually a darning foot. I have a newer machine I bought for taking to class has a foot, but I can’t aford the foot right now. So it will be awhile yet before I can work on my online class. Anyways — the colours in this quilt all simply gorgeous — I guess if we can’t have spring, we can have beautiful spring colours in our home like in your quilt. I can hardly wait to do allover jester hats. We just got another blanket of snow in the last hour and a half. Thank you for sharing with us — you are an inspiration to me. 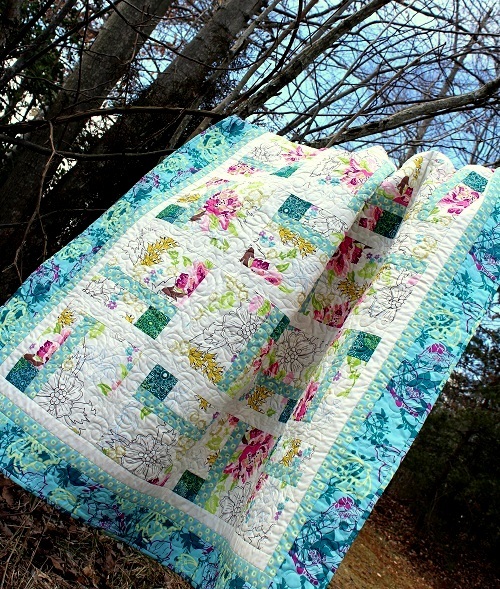 That’s a perfect name for this quilt — it does look like watercolors. And very springy! Which it is not here! What a lovely quilt! 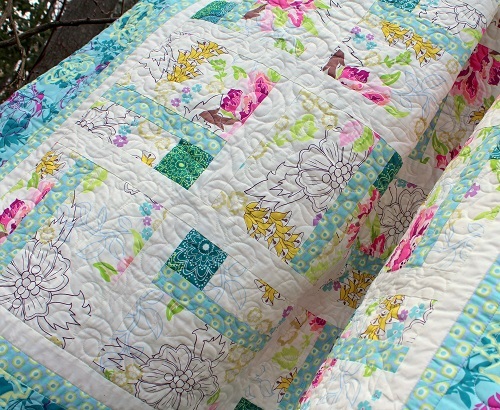 I would not have chosen that main fabric myself, but the way you used it made it sooo lovely! 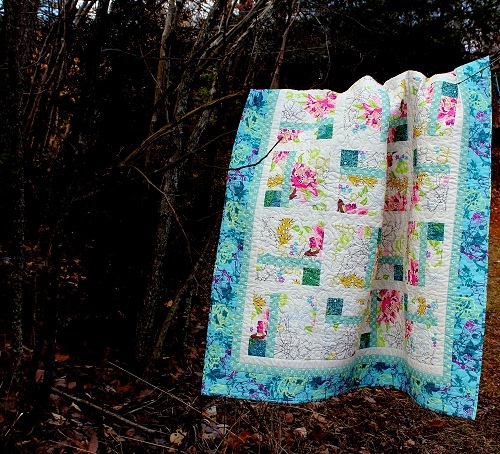 This is an absolutely gorgeous quilt. What a perfect name for a beautiful quilt. Fun fabric and you design really shows it off too! Great job Wendy. Looks like a fun quilt to make. This pattern is so light and inviting. 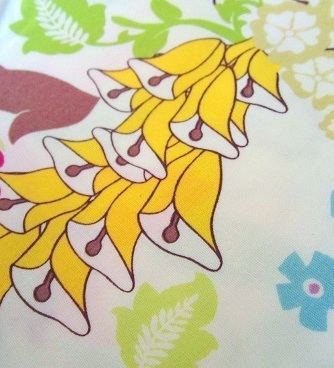 I would love permission to use this pattern as a challenge for my quilt guild. We are in Riverside, CA. About 35-40 of the 100 members would probably participate. Each sewer would choose their own fabrics to match the 2 1/2″ square block fabric I would be providing. We will definitely acknowledge you are the designer. Thank you so much. I have most of these fabrics already and just love this line. Your design is so perfect I will have to buy the magazine so I can use them!!! I just love your work. My two wishes this spring is that my Dad beats the liver and lung cancer and my Mom follows through on her commitment to eat right and regain her health. And since I can have lots more than 2 wishes I wish to create my own retreat center and work for me!!! Hugs my friend. This is absolutely beautiful! The fabrics complement the design perfectly. thanks for sharing! I love this. My 13 year old daughter is new to quilting. I think this pattern would be great for her to use as a beginner. Do you have step by step instructions for cutting and piecing? Thanks! Any chance you have any of the fabrics used in watercolor sketches or where I could still get some? I am looking for the Daylight Pond PA208 fabric. It’s a long shot but thought I’d try! It is such a very beautiful quilt. Thanks!